The eradication of polio is a key aim of Rotary. There is no cure, but there are safe and effective vaccines. The strategy to eradicate polio is therefore based on preventing infection by immunizing every child until transmission stops and the world is polio-free. Over the last 70 years a massive immunisation programme has reduced polio cases by 99% with an estimated 350000 cases in 1988 to just 74 reported cases in 2015. Eradicating a disease costs billions but we are now very close to achieving this with only 3 countries in the world reporting any cases. The ride will take place on Sunday, November 25th, starting from Estoi Palace Pousada at 9.30 am and ending in the square in Estoi. It will cover around 35 kms including the Cerro Miguel. All money raised from this will be matched 2 to 1 by the Bill Gates Foundation giving us an opportunity to raise a substantial amount to combat this terrible disease. 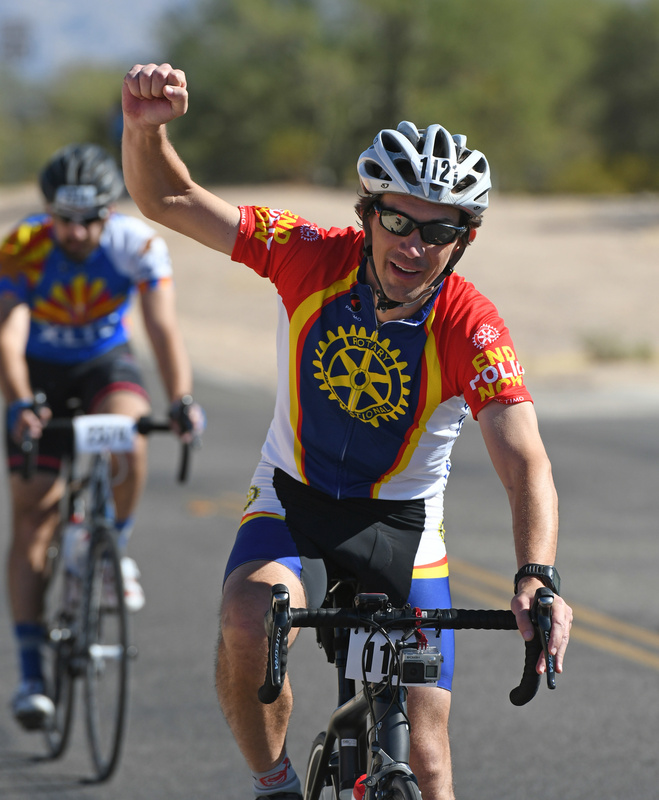 If you would like to make a donation to sponsor a rider, or just make a donation to help end polio, please complete the donation form on the right. To take part in the ride, sponsor a rider or make a general enquiry please contact Shirley Dunne using the contact form below. After you click on "Continue to payment" you will be redirected to a payment page. We will never sell or give away your email address to any other party. We will send you our regular newsletter approximately four times a year and we may, from time to time, contact you with news of upcoming events which may be of interest. To view our current and recent newsletters please click here.